I live in China and receive traditional Chinese education from childhood. When I was young, I thought this educational mode had limited my imagination and ideal. However, those seemingly restrictions have become the basis of successfully dealing with affairs in society as I grow up and thus I achieved a deeper sense of freedom and understanding of Chinese values. ancient civilizations begin disappearing worldwide,we should preserve and extend it. The fifteen wall paintings which use the traditional Chinese totems, symbolic patterns and flowers endowed with the meaning by traditional culture have explained the important twelve values of China. The patterns are designed according to historical drawing and classic traditional patterns. The purpose of this work is not only to improve the spiritual quality of Chinese citizens, but also to spread Chinese culture and principles to the world. This series of creations require the painter to grasp the use of writing brush and have a basic understanding of traditional culture for the purpose of recapture the charm of it. The audience will firstly be attracted to the profound Chinese painting and then get nudged into reading the complicated details and meanings of it, by doing so, the content will be deeply imprinted in their minds. The project was begun in October, 2016 in Dalian and was finished in December, 2016. 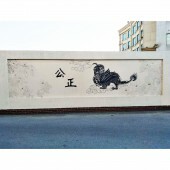 Using waterborne fluorocarbon lacquer as raw material and the line drawing in traditional ink and brush style, the wall paintings are completed in the busy streets with residents passing by frequently. The kids in the neighboring kindergartens would learn to read those paintings and characters with the help of their parents. Since some of paintings are inherited from ages ago or designed based on historical imagination, many parents need to identify them by referring to books, which is beneficial to a deeper understanding of the traditional culture. If everyone can understand others and share common beliefs, then it would be a society of harmony and freedom. 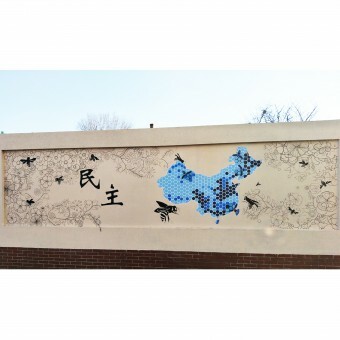 The fifteen wall paintings which use the traditional Chinese totems, symbolic patterns and flowers endowed with the meaning by traditional culture have explained the important twelve values of China. The purpose of this work is not only to improve the spiritual quality of Chinese citizens, but also to spread Chinese culture and principles to the world. The biggest difficulty is to find the totem that is able to corresponds to the values for the purpose of striking a chord with the people.Since some of paintings are inherited from ages ago or designed based on historical imagination Despite the challenging fact that ancient culture is gradually forgotten, it is one of the purposes to evoke people’s attention to the civilization. we managed to complete the work with high quality to impress the audience and evoke their interests, so as to convey our beliefs in a more deeper way. Yue Wang, graduated from Dalian Polytechinic University with a master's degree and majored in contemporary art in 2016. She established the creative workshop named Yi Shu in Dalian of China. 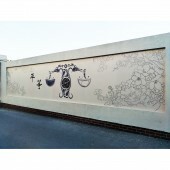 The main business includes creative design,wall painting,graphic design,packaging design, installation art and etc. With great passion for art, she hopes to create the works that can touch the heart. She favors leftover bits and pieces as her material in her creation.In 2013 the tree cave paintings she created became a sensation in China and won the excellence prize of HKDA Awards. In 2016 she was responsible for the art poverty alleviation project “To fish，to give fish " in Xian county in Heibei province of China and received IF Public Value Student Award. Chinese Philosophy of Life Wall Painting by Wang Yue-Yishu Creative is a Nominee in Social and Behavioral Sciences Design Category. · Click here to register today inorder to be able to view the profile and other works by Wang yue-YISHU Creative when results are announced. Chinese Philosophy of Life Wall Painting by Wang Yue-Yishu Creative is Winner in Social and Behavioral Sciences Design Category, 2016 - 2017. · Press Members: Login or Register to request an exclusive interview with Wang yue-YISHU Creative. 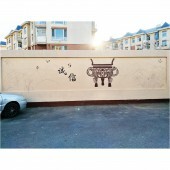 · Click here to register inorder to view the profile and other works by Wang yue-YISHU Creative. Did you like Wang Yue-Yishu Creative's Social Science Design? You will most likely enjoy other award winning social science designs as well. Click here to view more Award Winning Social Science Designs. 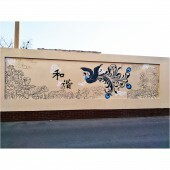 Did you like Chinese Philosophy of Life Wall Painting? 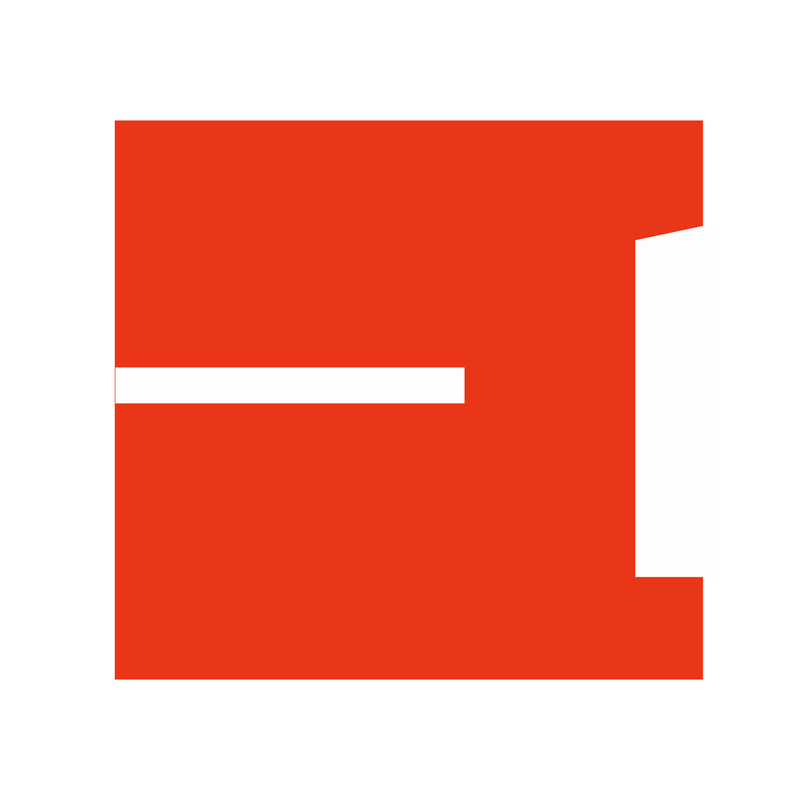 Help us create a global awareness for good social science design worldwide. Show your support for Wang Yue-Yishu Creative, the creator of great social science design by gifting them a nomination ticket so that we could promote more of their great social science designs.